I mean it’s just a car, but wow what a car. I’m visiting my friend Tom in Tampa, and we go out for Cuban food. 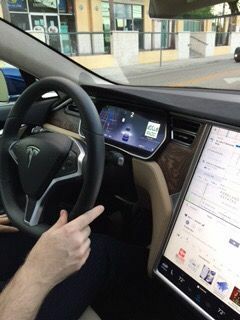 I had no idea he had a Tesla. It is the Leonardo DiCaprio of cars! Seriously, it is a super cool car with virtually no moving parts. There’s no oil to change and no transmission fluid either. In fact there is so little engine that you can store stuff under the hood. Aka the Frunk. I do not care if you are in environmentalist or not. You may be a lover of fossil fuel’s and totally addicted. But I have to say, if you could afford a Tesla, you would be very happy with it.